What is UTP (Unshielded Twisted Pair) Cable? 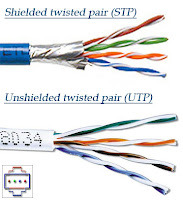 UTP - Unshielded Twisted Pair Cable is a popular type of cable that consists of two wires twisted around each other. The UTP has four pairs of wires and all inside plastic sheathing. The biggest reason that we call it Twisted Pair is to protect the wires from interference from themselves, each wire is only protected with a thin plastic sheath. RJ-45 connectors are added at the both ends of the STP and UTP cable. Due to its low cost, UTP cabling is used extensively for local-area networks (LANs) and telephone connections. UTP cabling does not offer as high bandwidth or as good protection from interference as coaxial or fiber optic cables, but it is less expensive and easier to work with. This is the most popular form of cables in the network and the cheapest form that you can go with.